Marco Rubio (R-Fla.) is either exceptionally gullible or just plain dishonest. In either case, he has repeatedly demonstrated that he is not qualified to be president of the United States. Rubio would have us believe that he didn't understand the importance of securing the borders before granting legal status and a pathway to citizenship to millions of illegal aliens when he signed onto the Gang of Eight's amnesty bill. In fact, Rubio was so excited to be playing with the big boys that Chuck Schumer (D-N.Y.), John McCain (R-Ariz.), and Lindsey Graham (R-S.C.) had no problem getting him to be the poster boy for amnesty. Rubio's failure to understand that he was being played and his inability to recognize that what he was selling was amnesty raises the question of how he would fare against the likes of Vladimir Putin, the leaders of Iran, or amnesty advocates if he were elected president. Likely not very well. At the recent CPAC gathering, Rubio tried to convince conservatives that he has repented and now sees the importance of putting border security first. However, Rubio still doesn't get it. During questioning by Sean Hannity, Rubio continued to insist that illegal aliens are good, law-abiding people. 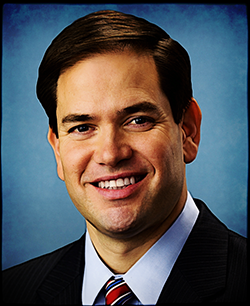 "You have 10 or 12 million people in this country, many of whom have lived here for longer than a decade [and] have not otherwise violated our laws other than immigration laws," said Rubio. If Rubio really believes this, it shows that he is too naïve and too ill-informed to be president. After all, there is no lack of information about the multiple job-related felonies committed by the vast majority of illegal aliens and the harm that their victims suffer. Congress has held hearings on illegal alien job-related felonies, including massive child identity theft, and the Actuary of the Social Security Administration has reported that 75 percent of illegal aliens use fraudulently obtained Social Security numbers, which is a felony. On the other hand, if Rubio is aware of the job-related crimes committed by illegal aliens, as he should be, it means that he is deliberately misleading Americans when he asserts that illegal aliens are law-abiding. At best, Rubio is extremely gullible and naïve. At worst, he is playing fast and loose with the facts and being less than honest. In either case, he needs to forget about running for president and seriously consider returning to private life at the end of his current term in the Senate in order to gain the skills needed to be a statesman rather than a political hack.